Each filter plate is packaged in a single cardboard box and is packed in 5 boxes. 20-inch 40PPi filter plate, size 508mmx508mmx50mm. Remove AdTech Ceramic Foam Filter, there is a very small amount of white powder in the cardboard. 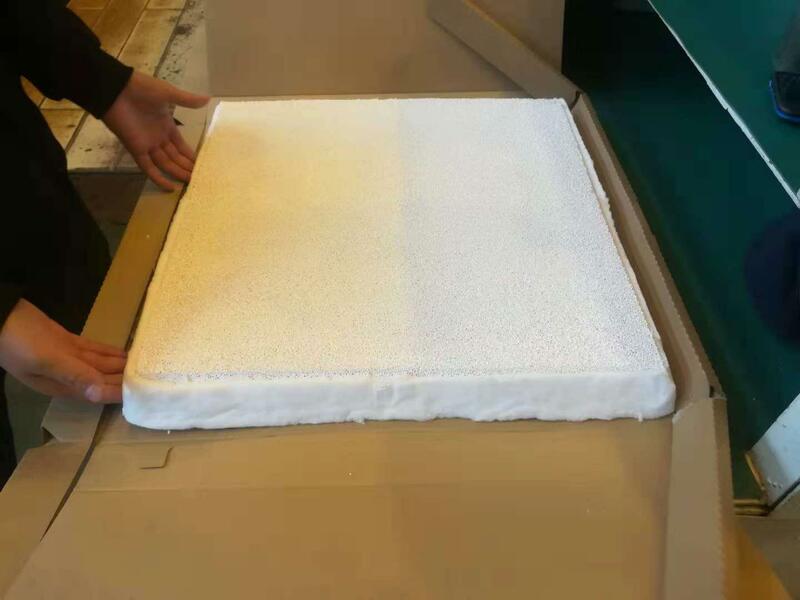 The asbestos sealing edge around the AdTech Ceramic Foam Filter is of good quality and meets the requirements for use. Pick up AdTech Ceramic Foam Filter, compare it with the flashlight, and observe the uniformity of light transmission from the other side of the filter. No light transmission dead zone is found, and the light transmittance is checked to meet the requirements for use. Purge the slag on the surface of AdTech Ceramic Foam Filter with compressed air. Gently put AdTech Ceramic Foam Filter into the filter box, and press the sealing gasket around AdTech Ceramic Foam Filter by hand. The surrounding is compacted without gaps and sealed with refractory mud.